Beaten Down by Blood charts an extraordinary journey from the trenches facing Mont St Quentin through the frenetic phases of the battle until the final objectives are taken. This is the story, often told in the words of the men themselves, of the capture of the ‘unattackable' Mont and the ‘invincible' fortress town of Péronne, two of the great feats of Australian forces in the First World War. Below the shattered ground that separated the British and German infantry on the Western Front in the First World War, an unseen and largely unknown war was raging, fought by miners, ‘tunnelers' as they were known. It was a war within a war in its most literal sense. Australian tunneling companies took part in many of the largest battles on the Western Front. Crumps and Camouflets, is the first complete history of Australia's role in the tunneling war of 1914-1919, of the men and units in which they served, and of life in the tomblike tunnels of the war underground. Michele Bomford holds a Masters Degree in History and a Diploma in Education from the University of Sydney. She was a History teacher for many years before turning to research and writing at the end of 2008. 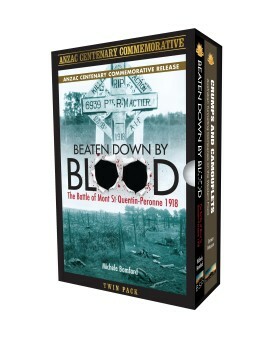 The Battle of Mont St Quentin-Peronne 1918 follows her first book, Beaten Down By Blood: The Battle of Mont St Quentin-Peronne 1918, the research for both supported by an Australian Army History Unit Grant in 2009. As well as her passion for Australia’s role in the First World War, she is interested in 19th and early-20th century Australian History and Family History. Damien Finlayson is an amateur military historian with a special interest in the First World War. He has worked as a hydrogeologist with a private consulting company for the past twenty years and holds a Bachelor and Master degree in science. Damien is a member of the Western Front Association. His articles on the Australian tunnelling companies have appeared in the association’s journal Stand To! and the journal of the Australian Military Historical Society, Sabretache.This is his first book. He lives in Victoria with his wife Sacha, and three children, Peter, Imogen and Gretl.